The superior articular facet is stretched out as well as concave. 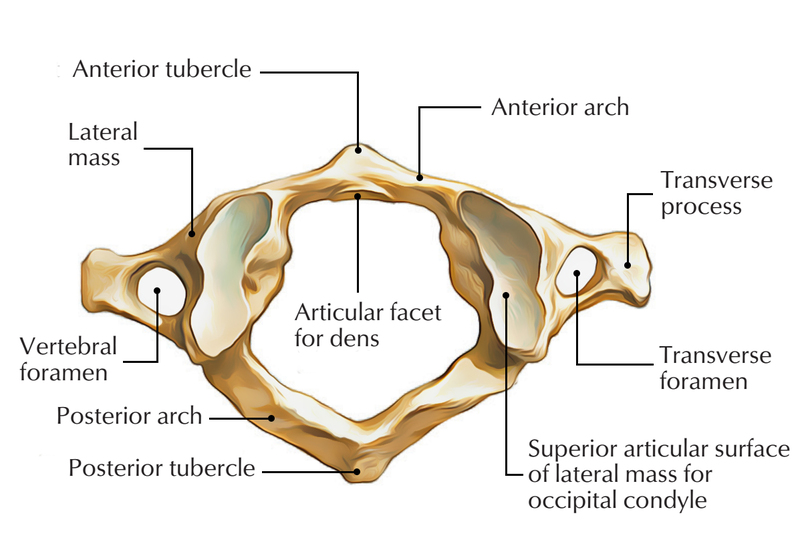 In order to create the atlanto-occipital joint, it is pointed upwards as well as medially to create joint with the equivalent condyle of the occipital bone. The inferior articular facet is flat as well as round. In order to create the atlantoaxial joint, it is pointed inferior, medially and backwards for join creation with the equivalent facet on the axis vertebra. A small irregular tubercle indicates the medial surface of the lateral mass in order to provide attachment for the transverse ligament of the atlas. From the lateral masses the transverse processes project laterally. Compared to other cervical vertebrae they are stronger and larger. For the rotation of the atlas vertebra, the elongated transverse processes function as levers.